Something's coming, somethin' good If I can wait! — Lyrics from "Something's Coming"
ALBANY — Stephen Sondheim's words, written more than 60 years ago for a song in "West Side Story," sum up the optimistic if not fully formed attitude at the Palace Theatre today as the historic venue looks toward launching, for the second time, its ambitious plan to renovate the theater. Here are a new number and a new date to put in your head when thinking about the future of the Palace: $35 million and sometime in 2020. But first some history. In July 2016, the Palace unveiled a massive project that would have wholly remade not only the theater but its entire block. In addition to renovating and expanding the theater, the plan called for a new, state-of-the-art, 600- seat theater on North Pearl Street just north of the 2,800-seat original, a former RKO movie house that opened in 1931. Even more astonishing than the $65 million price tag was, to many industry observers, the fact that the Palace didn't have any publicly announced funding for the project — not a dime. The general metric in the arts world, experts say, is to have commitments for 50 to 80 percent of the goal before a project is launched. The Palace, when it announced the $65 million plan, had nothing. At the time, the Palace Performing Arts Center Inc., the official name of the not-for-profit entity that has operated the theater since 1984, didn't even own the building. It still belonged to the city of Albany, which leased it to the nonprofit for $1 a year. The lack of ownership was a key sticking point for the renovation, because donors would be less inclined to fund it, and the city was not eligible for grants for which the nonprofit would qualify if it owned the real estate. A bitter battle over the disposal of the building ensued, with some members of the city's Common Council feeling that the terms eventually approved — $750,000, paid at $25,000 a year for 30 years — represented a bad deal for the city. The purchase finally was completed on the last business day of 2017. Finally, Alan Goldberg, the Palace board chairman of nearly 20 years, stepped down at the end of last year. His replacement, WNYT Newschannel 13 General Manager Steve Baboulis, who has been on the board for many years, led his first meeting as chair last week. Mindful of the hype and expectations created by the 2016 announcement, Fogarty and Baboulis have been more circumspect about the revised renovation plan for the Palace. They won't go so far as to say the $65 million proposal was too big in scope or announced prematurely — "It was visionary," Fogarty said — but they want to reframe the public's understanding of what's happening at the Palace. The new project costs $35 million. There may be a future phase, but, for now, the price tag is $35 million. According to a letter sent to potential donors and other stakeholders that was obtained by the Times Union, the cost is broken down into about $19 million for renovation of existing space, including new seats that would boost capacity to 3,100 and an elevator that would allow handicapped access to basement and mezzanine levels; and $13 million for new spaces, including an expanded lobby and loading dock. The project has been awarded a little less than $2.9 million in Regional Economic Development Council grants from the state, Baboulis and Fogarty said. Further, they said, consultants have estimated that the Palace's renovation will qualify on the federal level for $7 million in historic tax credits and $5 million in New Market Tax Credits, the latter for investment in low-income neighborhoods. Though the grants and tax credits wouldn't be disbursed until the project is essentially paid for, their promise has started to loosen up taps for private funding. Baboulis and Fogarty acknowledged the Palace has received a "seven-figure gift" from "an anonymous individual." (Several sources put it at $1 million from a member of the board.) Baboulis and Fogarty also said additional private commitments have come in, though they declined to specify numbers or amounts. With all of that in place, they said, the Palace has hired a national construction-management firm with an Albany office, Gilbane Building Co.; Phinney Design Group of Saratoga Springs, which has team members who have worked on past Palace projects; and DLR Group, a global company with many theater designs to its credit. "We very specifically hired a team that has a very strong breadth and depth of theater experience," Fogarty said. The project is aimed at making the theater more comfortable and accommodating for patrons as well as performers. Final designs have not been completed, Fogarty cautioned, and renovating a historic building is a complex process often rich with surprises and changes, but for now attendees can expect larger and more lobby space, at least one elevator, new theater seats, additional handicapped seating, more and better restrooms and additional amenities including concessions stands, bars and a VIP lounge. Backstage, a proper loading dock is planned, as the current one is only a third as wide and a third as tall as industry standards; additional storage, rigging and high-tech capabilities will be added; and the dressing rooms, now almost comically retro in their size and facilities — wardrobe cases have to be hauled up by a winch, for example — will be improved. The planned changes would make the theater more appealing to patrons for obvious reasons, Fogarty said, and to visiting performers as well: "Sesame Street Live" had to skip a Palace stop one year because its set was too large, and some other shows haven't been able use all of their sets; The Big Wheel prop used in "The Price is Right Live" shows would no longer have to be disassembled, as it does to be brought through the current loading dock; and artists and promoters would appreciate the extra revenue possible with 300 more seats to be sold. There are no plans to expand the stagehouse to accommodate big touring musicals. "We're not doing Broadway. We aren't," said Fogarty, referring to Proctors in Schenectady when she added, "There's already a theater doing that very well in the Capital Region." Nor is a second theater planned, though the Palace controls almost all of the land on its side of North Pearl from Clinton Avenue north to Wilson Street, where the new 600-seat theater was originally designated to go. And a state-of-the-art video post-production facility that would have been the only one of its kind between Manhattan and Montreal, called for in the 2016 proposal, has been scrapped. Again, at least for now. "The items being addressed ... (are) exactly what I would expect to see for a historic theater desiring to remain relevant," said Ken Stein, president and CEO of the League of Historic American Theatres, which represents more than 380 venues and organizations nationwide. Stein, who told the Times Union in 2016 that he was surprised the original announcement was made before any money had been committed, said last week that Palace management's more cautious approach this time was prudent. Referring to the feasibility study and preliminary conversations with the local philanthropy community that the Palace is now conducting, Stein said, "All of this is done during what would be considered a 'quiet phase' of the campaign, giving the organization time to digest the feedback and make changes if needed." 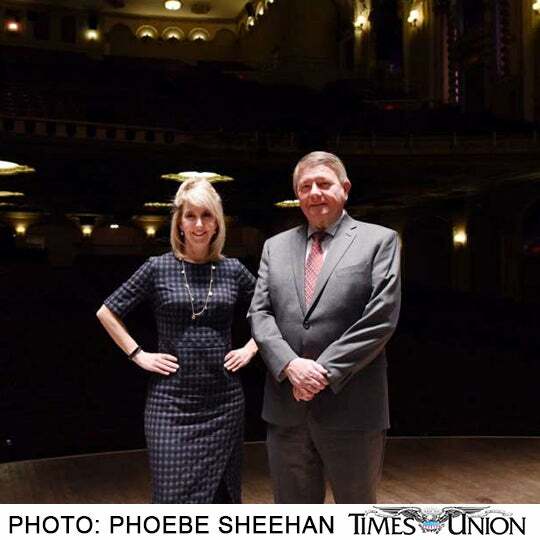 Philip Morris, CEO of Proctors, said, "The Palace is a critical piece of the performing-arts scene locally. There are a lot of different pieces that they need to address, and ... it sounds like they're doing the work that is necessary. I hope they're successful at it." Construction wouldn't begin before the second half of 2020. The Palace had hoped to start earlier, initially telling outside promoters and regular presenting partners, including the Albany Symphony, that the venue might not be available in winter and spring of next year, but those dates have again been opened up for booking, Fogarty said. There are no projections yet for a completion date or grand reopening. While that work for the future goes on behind the scenes, the Palace's 20-member staff is looking forward to a big winter and spring performance calendar, with appearances by comics including Dane Cooke, Larry the Cable Guy and Jim Gaffigan and concerts as varied as The Monkees and Judas Priest. The venue hosts about 180 events annually, about 85 percent of which have paid attendance. (The rest are community events.) Its full annual budget is about $5 million, although half of that is essentially "pass-through money" that goes to Ticketmaster; the yearly operating budget for the Palace Performing Arts Center is $2.5 million, Fogarty said, and projections for the current year's income already show the theater on track to be 14 percent ahead of last year. "There's always been aspiration to do something bigger, better, different, revitalizing," said Baboulis. "Sometimes it just takes time to figure out how to get that done right."